Maybe. North Carolina has four statutes that allow a grandparent to maintain an action for grandparent custody or visitation of a grandchild. Being able to proceed under any one of these statutes is not a guarantee that you will receive custody or visitation rights. North Carolina courts determine custody based on the best interests of the minor child. These four statutes below simply get you in the door to ask for custody and visitation. Fitting into the correct statute is the first step. Once we decide the correct statute, the court must still find that your custody/visitation is in the best interests of the minor child. If you are a grandparent seeking custody or visitation of your minor grandchild, the very first thing your lawyer must decide is under which North Carolina custody statute you must proceed. Determining which statute is right for you, requires us to ask a few questions. Are You Seeking Grandparent Custody or Visitation Rights? This is almost always the gateway question for any grandparent’s rights case in North Carolina. The discussion that follows relates to physical custody of a minor child. Physical custody means the physical care and supervision of a minor child. “Visitation” is a lesser form of physical custody. In other words, a parent can choose a child from visiting or spending time with a grandparent. With that said, if a grandparent wants to seek custody of a minor child, the grandparent must first establish standing. Standing in a lawsuit is the ability under the law to bring the lawsuit. In a custody case between grandparent and parent, the grandparent must show the court that the parents have neglected or abandoned the minor child, are unfit to care for the child, or have taken action that is inconsistent with the parents’ constitutional paramount right to custody of the child. It is extremely hard for a grandparent to defeat a parent’s constitutional right to custody. If you believe that your grandchild’s parents are unfit, you need to speak with an attorney immediately to discuss your case. What you may think of as neglect is probably not neglect under the legal standard. Consider what it would take for DSS to take a child away from a parent and you will have some insight into the definition of neglect. North Carolina treats grandparents seeking custody like all other third parties. The statute under which you must proceed under is N.C. Gen. Stat. §50-13.1(a). Under this provision, you don’t need to wait until a custody action is pending between the parents. You can file your claim for custody at any time. You must, however, overcome the parents’ constitutionally protected right to the absolute care, custody, and control of their minor children. Once you overcome the parental preference, you must still show that your custody over your grandchild is in the best interests of the minor child. If you only want a visitation schedule put into place, then how you should proceed depends heavily on whether or not there is a custody action already in place. Is there a custody action already taking place between the parents? This simply means, is there a custody lawsuit concerning your grandchild already playing out in court. A custody action can be an original court case to determine custody. It can also be a motion for modification of an original custody order. A modification is when one parent comes back to court to ask the court to reconsider the original custody order based on a change of circumstances. If there is a custody action already taking place, the grandparent’s route into court is relatively easy. If your grandchild’s parents are currently involved in a lawsuit over the custody of your grandchild, then you have a direct route into the lawsuit. You need only file a motion to intervene in the case. Then you would ask the court to grant you visitation with your grandchild. Under this scenario, the appropriate statute by which to proceed is N.C. Gen. Stat. §50-13.2(b1). When the court enters its order for child custody, it can award you with visitation time as well, provided that your visitation is in the best interests of the minor child. I must reiterate, N.C. Gen. Stat. §50-13.2(b1) is just your avenue into court. Just because you are allowed to intervene, does not mean that you will receive any visitation rights. The court can deny visitation if it is not in your grandchild’s best interest. Many times courts do deny visitation believing it is in the best interest of the child for the parents to decide how often children visit with their grandparents. N.C. Gen. Stat. §50-13.2(b1) also covers the grandparent’s right to intervene in a custody case involving an adopted grandchild. Under this scenario, a grandparent’s child (the parent) has remarried, and his new spouse (the stepparent) has adopted the minor child (the grandchild). Just as with custody cases involving biological parents, if the stepparent and the biological parent are involved in a custody action, a grandparent can make a motion to intervene under N.C. Gen. Stat. §50-13.2(b1). The grandparent must, however, show an added step by establishing that he or she has a substantial relationship with the minor child. North Carolina has not explicitly defined what “substantial relationship” means. However, the courts have regularly provided visitation rights to grandparents who have raised their grandchildren since birth, or who have demonstrated active involvement with the minor child such as regular visits with the grandchild and overnight stays. If your grandchild has been adopted by a stepparent or any person that is related to the child, you can file a direct lawsuit for visitation rights. N.C. Gen. Stat. §50-13.2A allows a grandparent to file a lawsuit for visitation rights (not just intervene in one already filed), for a grandchild that has been adopted by a stepparent or any relative of the child. You will still need to demonstrate a substantial relationship with your minor grandchild. If you can do that, then the court can award you with visitation rights as long as it is in the best interests of your grandchild. Please note, if a child has been adopted by parents that are not related to that child, a biological grandparent cannot request visitation rights under N.C. Gen. Stat. §50-13.2(b1) or N.C. Gen. Stat. §50-13.2A. Under this scenario, you can proceed for custody under N.C. Gen. Stat. §50-13.5(j). This statute allows you to seek custody and/or visitation even after a custody order has been entered provided you can show a substantial change in circumstances. You must also demonstrate, however, that your grandchild is not living in an intact family. McIntyre v. McIntyre, grandparents filed a lawsuit for visitation with their minor grandchildren. At the time the grandparents filed their lawsuit, there was no custody action pending with respect to the children’s parents. The parties argued over whether the grandparents could ask for visitation when a custody action wasn’t pending. The parents argued that they were an intact family and therefore, the grandparents could not seek visitation. The case made its way all the way through the court system until it reached the NC Supreme Court. The North Carolina Supreme Court determined that the grandparents could not sue for visitation rights when the minor child was living in an intact family, and no custody proceeding was ongoing. While an intact family has not been defined with clarity, subsequent to the McIntyre decision, our courts have determined that a child living with one parent is sufficient to constitute an intact family. Grandparent Custody – Do I need a lawyer? No matter what statute you proceed under, getting grandparent custody or visitation of a grandchild is not be a walk in the park. You need to retain the services of a qualified child custody attorney with experience in grandparent’s rights cases. Early action is key. Timing is critical in determining grandparent’s rights. If you wait just a little too long before making your move, your right to even make a claim for visitation could be lost. When it comes to issues of grandparents’ rights, the courts of North Carolina have clearly distinguished custody from visitation. The basic law states that grandparents only have a right to intervene and seek visitation while the custody case is ongoing. 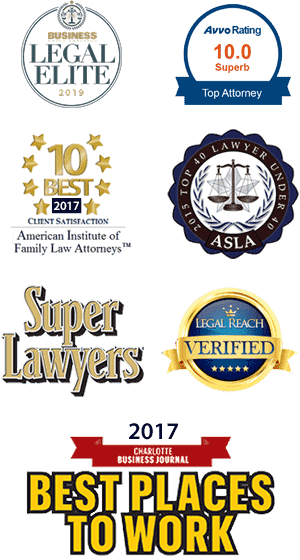 Once parents have already reached an agreement on custody, or when the court has already decided the custody, grandparents generally can no longer seek visitation. If you are a grandparent with only the best interests of your grandchildren in mind, it is very important that you contact us early so you that can have an informed decision on what to do next. Your prompt action is necessary to maintain your close relationship with your grandchildren even after their parents’ divorce.